Most of us are fond of photos ~ would admire thyself on a photo and happily pose for one… !! – most post their photos on social network sites like Facebook, Instagram, Myspace and the like ~ and expect that friends and dear comment on that to their liking….. the photo looks quite ordinary at first sight !!!! 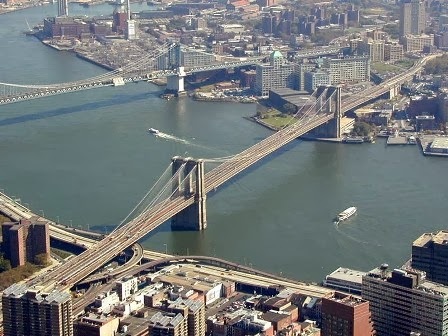 The Brooklyn Bridge in New York City is a sensation and any tourist would sure admire it which is one of the oldest suspension bridges in the United States. Completed in 1883, it connects the boroughs of Manhattan and Brooklyn by spanning the East Rive. It has a span of 1,595.5 feet (486.3 m) ~ since its opening, it has become an icon of New York City. Heard of ‘Selfie’,,,,,,,,,,,,,, a term discussed by photographer Jim Krause in 2005, although photos in the selfie genre predate the widespread use of the term. In the early 2000s, before Facebook became the dominant online social network, self-taken photographs were particularly common on MySpace. Selfie - typically "an amateurish, flash-blinded self-portrait. Early Facebook portraits, in contrast, were usually well-focused and more formal, taken by others from distance. In 2009 in the image hosting and video hosting website Flickr, Flickr users used 'selfies' to describe seemingly endless self-portraits posted by teenage girls. A selfie is a type of self-portrait photograph, typically taken with a hand-held digital camera or camera phone, and are usually taken in a slightly tilted manner. Selfies are often associated with social networking. In the Korean entertainment industry the word selca (short for "self camera") means photos taken of oneself. You can find so many ‘selfies’ as you log on to FB and browse through it…………… people keep loading their photos taken by themselves … !!!! Now here is the photo stated to be looking ordinary at first sight – it is in fact dubbed as ‘sickest selfie’ of all times by the Newyork Post. Here is something taken on this from the web including Daily Mail. The rogue self-portraitist has been described as a "tourist" in reports. The ‘sickest’ …’rogue’ – adjectives are because the lady is in fact taking a photo of herself even as a suicide drama is underway on the Brooklyn bridge ~ the bridge may be a perfectly logical extension of modern tourism's obsession with the selfie. People take pictures of themselves wherever they go, from cathedrals to airports to funerals, always the same face grinning at the camera. If you are travelling alone, it's a way to share the experience and report moment by moment on your trip – but not when somebody is attempting to end his life and one takes a photo to capture for her posterity. …. Crazy !!! It is reported that a witness to the woman's heartless selfie said that she knew exactly what was going on in the background at the time. The suicidal man climbed on the bridged and threatened to jump ~ a group of onlookers, including the woman, watched for 25 minutes as police attempted to rescue bridge jumper ~ and a news photographer captured this shot of the tourist snapping a picture of a Brooklyn Bridge jumper ~ and what do you call him ?!?!? Police eventually saved the man's life - talking him down from the bridge. 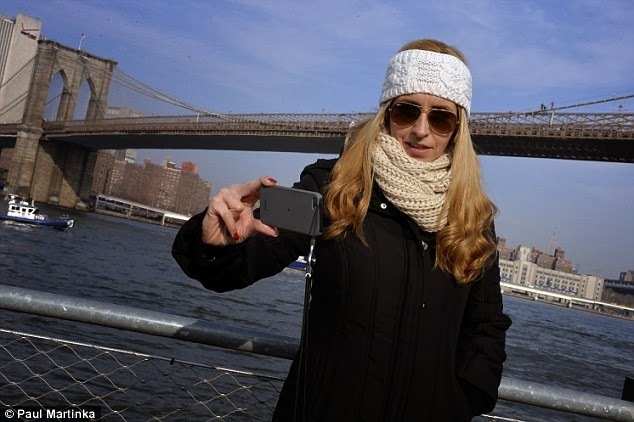 The woman, who had long blonde locks is seen wearing a matching scarf and headband, holding out her camera phone and seemingly making sure that she captured the bridge jumper in the background of her shot. During that time, police boats roared through the water and a police helicopter buzzed overhead as officers inched out toward the desperate man. That did attract derision ….. 'Since when is suicide fun?!' Friends of student who tried to kill himself live on internet hit out. It is further reported that when a reporter for the New York Post asked the woman for her name, she suddenly became camera shy and refused to talk.